A few months ago, Maddy from Nonpareil wedding magazine contacted me and asked if I would be interested in being a part of one of their upcoming issues. They were asking some of their favorite wedding bloggers how they’d envision the perfect Big Day. Since I look at hundreds of weddings each week, I am always changing my idea of what my “perfect day” would be like (even though I’ve already had my perfect day, a girl can dream right?!). :) One thing though that I am always drawn to is the smaller more intimate weddings. The ones were the couple chooses details that mean something to them and the day is designed with lots of style. Cortnie took my inspiration a step further + created a story behind the look to turn it into a real life fairy tale. What if this gypsy like couple were sailing around the world together, collecting souvenirs from each country, then this couple were shipwrecked onto a beautiful destination. 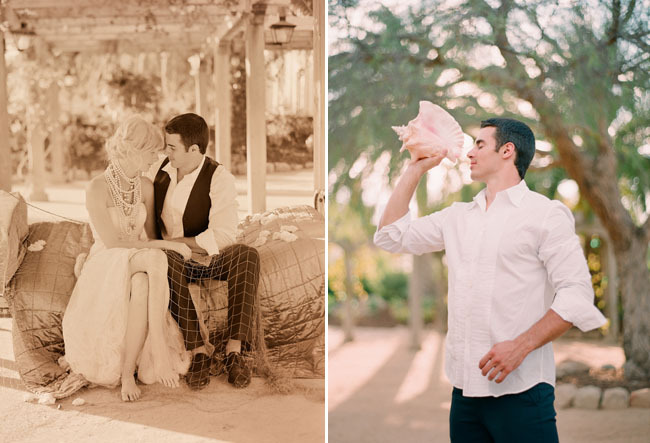 How would they incorporate their treasure trove into a tablescape and into their wedding day? This led to an unconventional table design adorned with treasures from their romantic seafaring journey on their boat together. This whole plot inspired the story book romance of a shipwrecked nomadic look which I just love! Oh, and you may have guessed, but if not, the photography is by none other than Elizabeth Messina! She blows my mind every time with her beautiful photos!! 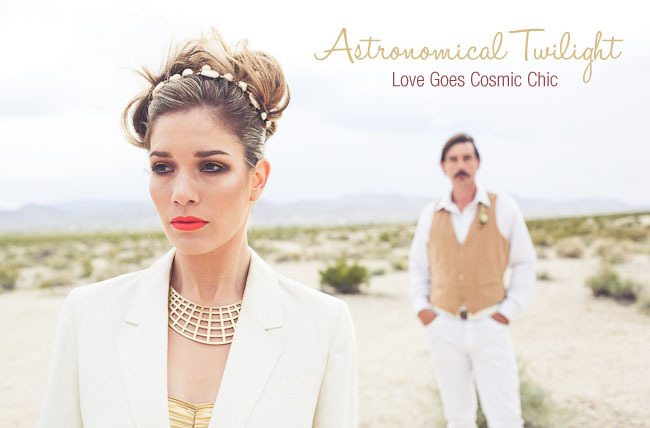 Thank you Elizabeth for capturing this shoot, your romantic vision was just perfect for this. Meg from La Partie Events was responsible for the unique flowers they used. 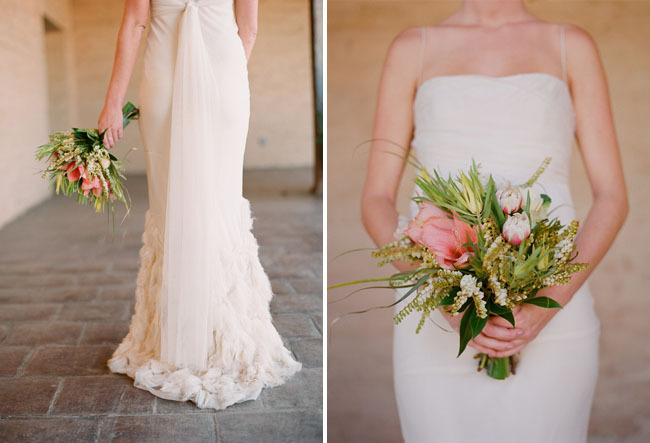 I just love Meg’s approach to flowers and knew she would do an amazing job. 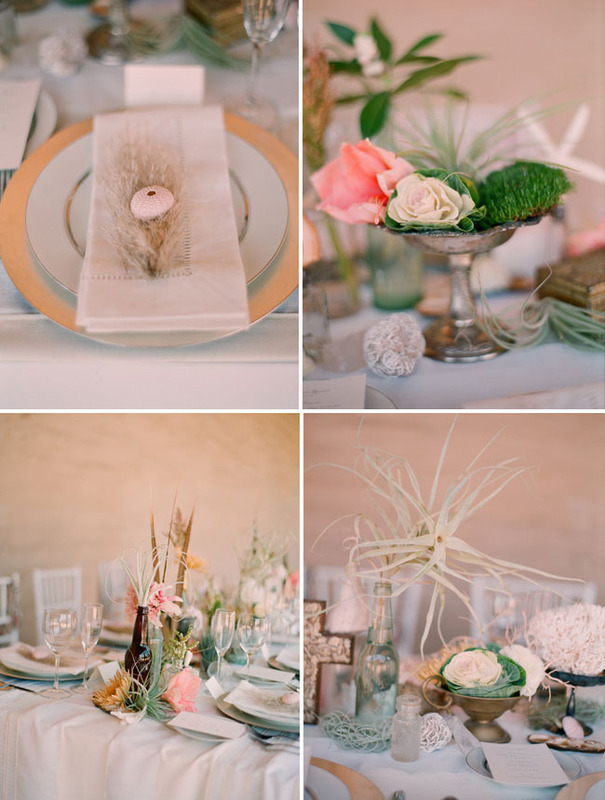 :) The different grasses that grow in or near the shore inspired Meg to incorporate these unconventional textures into the table. Grasses such as sorghum broom corn, curly willow, zebra grass, pampas grass and bear grass were used in the design. Cortnie also collected found treasures for the tablescape including vintage bottles topped with soldered seachells, vintage gothic crosses that could have been collected along the voyage from a church in Rome, vintage brooches that may have been found on the streets of Paris, and strands of pearls that reminded them of seafaring pirates. 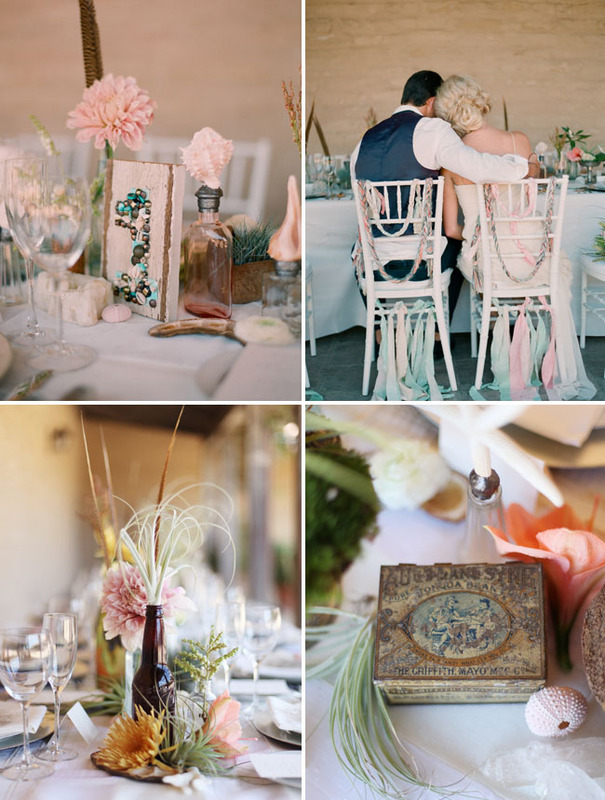 Meg added to this treasure trove of souviners with vintage bottles, mini treasure chest jewelry boxes overflowing with strands of vintage pearls, and old liquor and medicine bottles to hold the flowers. 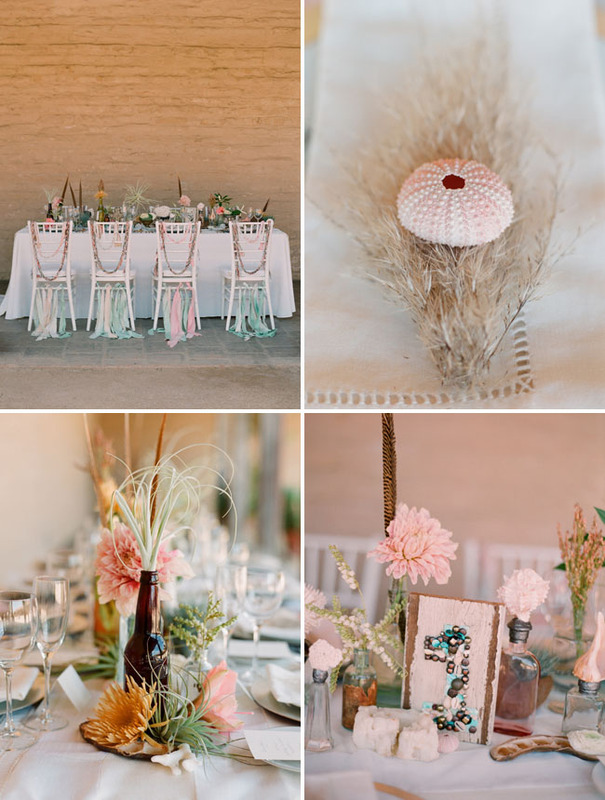 Other non-traditional flowers were used such as green berzelia, peach spider mums, leucadendron gold strike, kale, tulips, dahlias, amaryllis, fern, ranunculus and freesia. 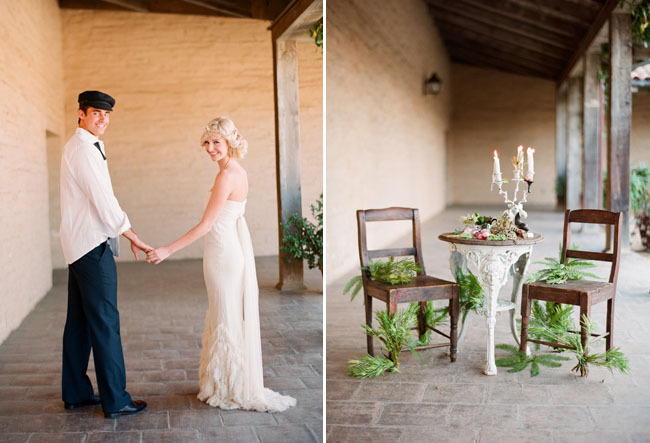 I just love the rustic yet elegant shipwreck theme! The color palette of peach, mint green, sage, mustard, and grey also played a key role in the design. I love what Cortnie did with the chairs! Fabric was torn into strips and dyes in a sofe sage green, then tied into knots around the bottom rung of each chair almost resembling seaweed. The leftover dyed fabric was tied into a braids, knotted and draped around the top of the chair, taling on a nautical rope feel. 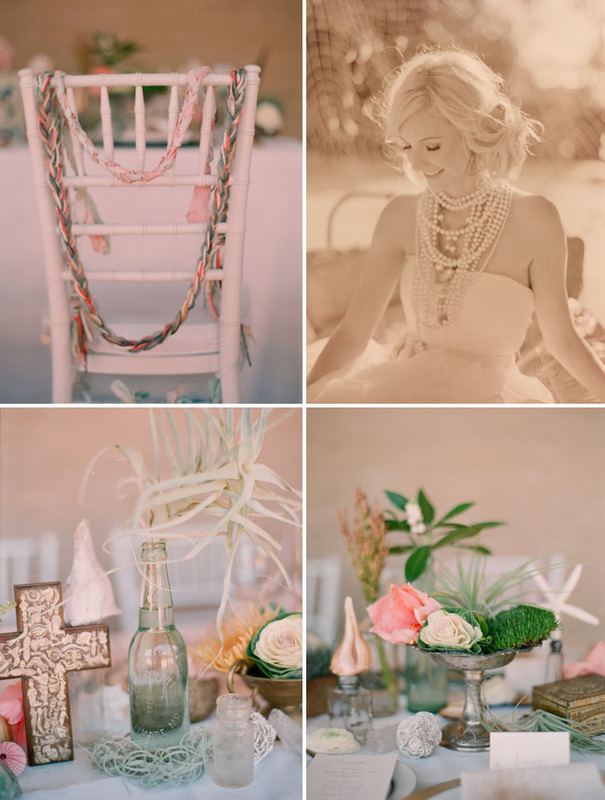 The chair was again accessorized with braids, made from fluffy yarn in strands peaches, greens, mustard, ivory and grey, adding further to the breezy boho vibe. Returning to the old days of pirates, each menu was hand calligraphed in silver by Laura Hooper Calligraphy and each place setting was mismatched with a variety of vintage pieces from different time periods. 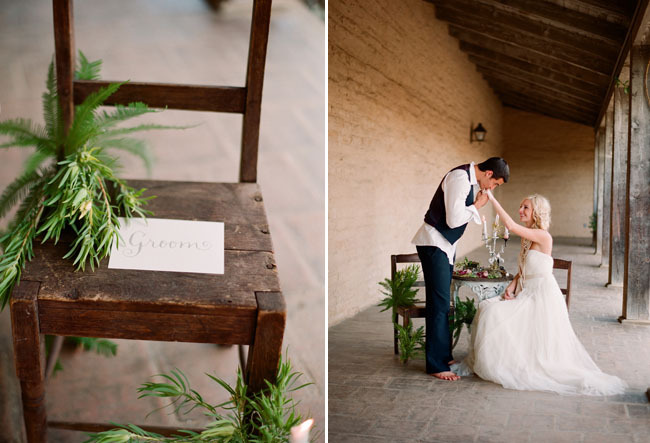 The bride + groom table was wrapped in grasses as in the table has been there for a hundred years and was being overgrown by nature. Pieces of broken china were mixed with floral arrangements and a large iron nautical candelabra. 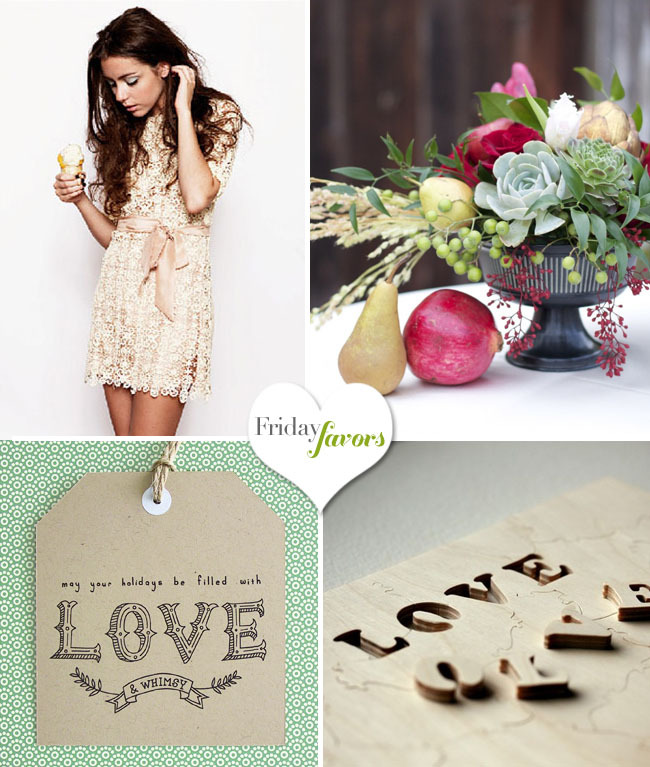 Fiore Beauty is a Featured Vendor of Green Wedding Shoes. For more information on how we select our Featured Vendors, click here. this is so unique and so pretty! 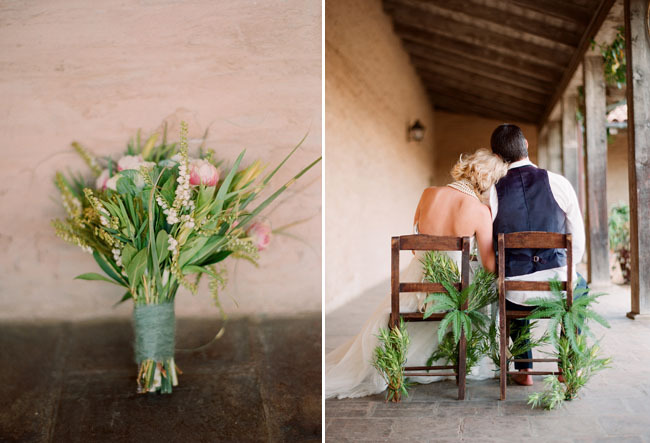 i love all the flowers and the chairs. it is all just so gorgeous! 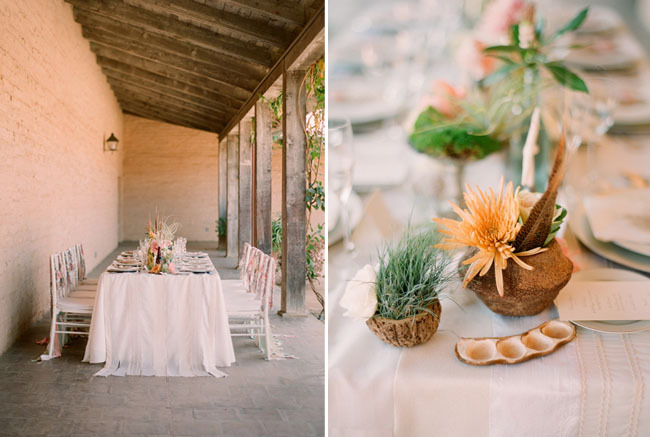 Stunning tabletop, and I love the way the chairs are decorated! Good beautiful moments of life, and beautiful photos. 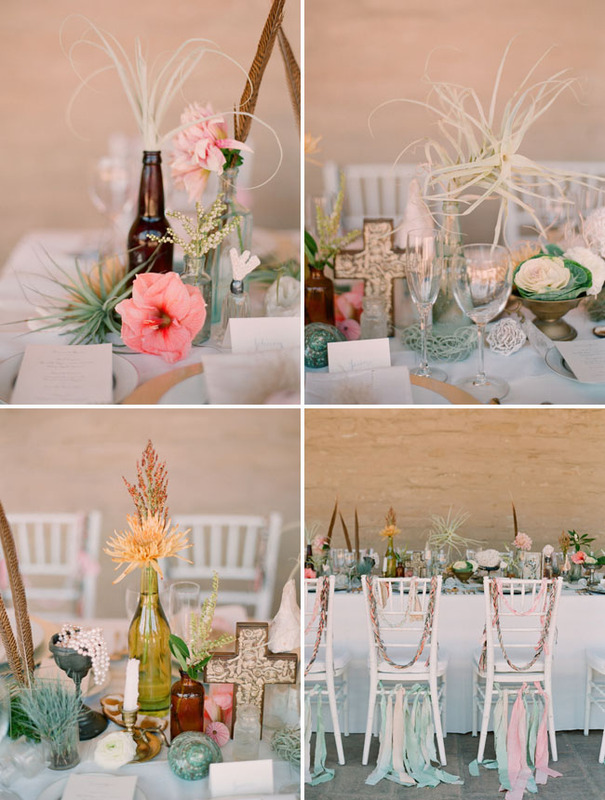 I LOVE the table – and the bouquet – so so pretty!! She is absolutely gorgeous. If I had a photo of myself as beautiful as the one of Cortnie holding the mirror in front of her face, I would stare at it all day every day. Beautiful, beautiful, beautiful. Well done, Elizabeth. Well done, my friend. 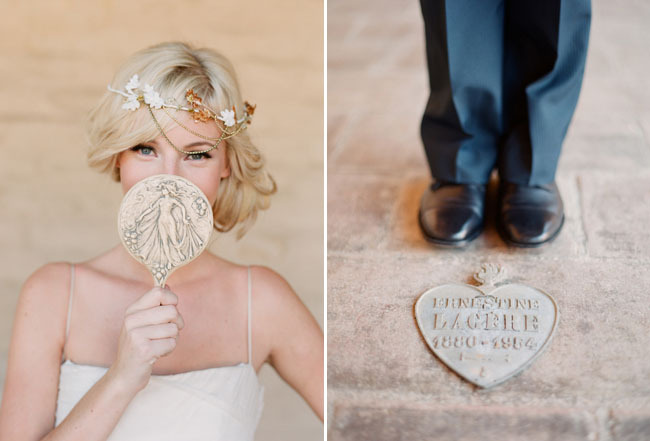 I love this wedding inspiration. It’s really beautiful and I am obsessed with her hair. I die for Eliazabeth Messina.. and then I die for Meg from La Partie and Cortnie of Canvas and Canopy. The hair and make is gorgeous too.. so romantic and ethereal. I mean what an “A list” team.. so stunning Jen! all i gots to say is cortnie is ridiculous! what a dream team, for sure. Good its very interesting blog post. The chair decorations are TO DIE FOR! 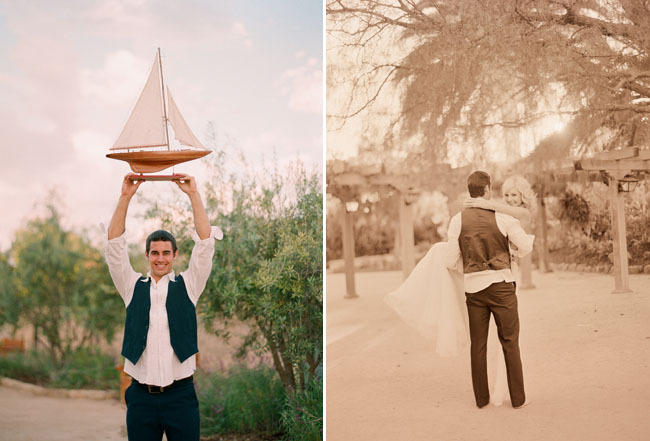 Pingback: “Shipwreck”-Inspired Wedding Shoot | live.laugh.celebrate. I know I am a bit late…but that Vera Wang gown is gorgeous…the mermaid style one with the feathery stuff at the bottom. Will someone please tell me the style name? :) Thanks!